These are few pictures of pots from recent firings. Click on any picture to enlarge. Almost forty years on, I remain fascinated by the plastic nature of clay and its transformation into ceramic by heat. What started as a therapeutic antidote to academic research, and the challenge of learning to throw on a potter’s wheel, remains a crucial part of seeking a balance between head, heart and hands. Throwing turned out to be just the start of an ongoing process of exploring this exacting and technical craft. I now choose to fire with wood, in a large kiln that I currently fire just once a year. The slow production cycle and unpredictable results require a level of detachment from concerns with efficiency, productivity or tight control. A lot can, and does, go wrong but it is the accidents, happy or otherwise, that often lead to new avenues to explore. 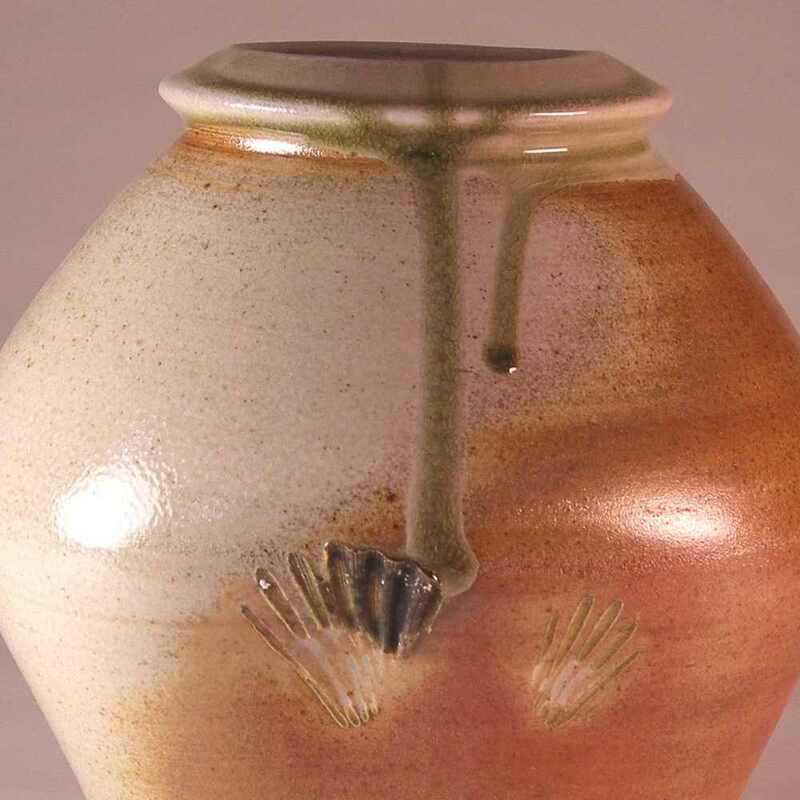 It is left to the flames, licking, flashing and depositing fly ash during the three-day firing, to leave their mark and decorate the pot surfaces. Almost a day into the firing, when the temperature reaches about 1000 oC, the chimney struggles to pull in sufficient air for full and clean combustion each time the firebox is stoked with wood. The mysteries of this ‘reduction’ atmosphere bring out a rich palette of red through purple, orange and browns in the clay whilst carbon trapping gives greys and black and melting ash deposits fuse to form a glaze. How best to stack the pots in the kiln, the firing schedule and the composition of the clay body are subject to ongoing (albeit slow) experimentation. To prevent the pots from fusing together with melted ash, the pots must all be separated from the kiln shelves, and from each other, with refractory wadding (made from fireclay, sand and sawdust) or with seashells. The stacking is a slow process, a three dimensional puzzle to maximise use of space in the kiln whilst leaving suitable paths for the flames to find a way through all parts, top, bottom, left and right from the firebox through to the chimney. Many pots are fired on their side. Bowls are often fired upside down, stacked on top of each other, to encourage the flames to lick across and flash the inside surfaces. 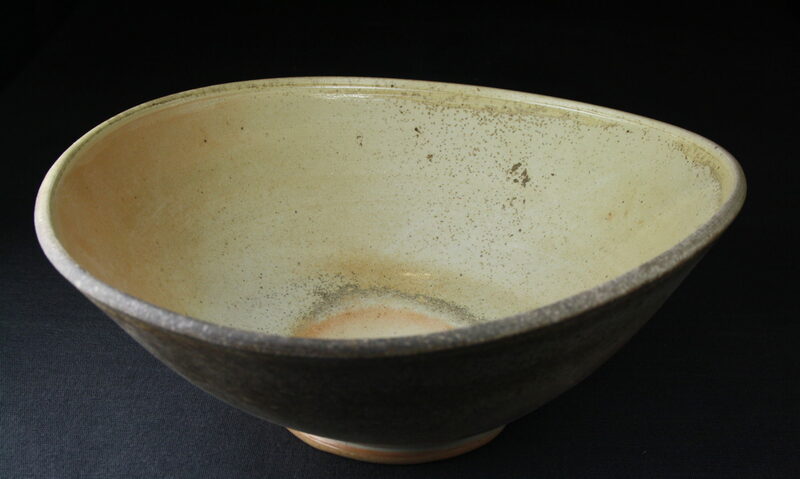 Simple wood-ash or shino glazes are sometimes also used. My current kiln was built in 2010 and is fired for three days and two nights with the support of an enthusiastic team of helpers. The top temperature of around 1340 oC is reached on the second day and is held for around 24 hours before the kiln is reduction cooled and sealed. The pots can be unloaded, cleaned and sorted a week or so later. My studio is in the basement of 27 High Street, Dunbar, an historic coastal town thirty miles east of Edinburgh. I have an ‘Anagama’ style woodfired kiln a few miles away near East Linton. As a largely self-taught potter, I find the attempt to master the many facets of this exacting and technical craft to be an ongoing challenge -which is what keeps me at it. Apart from the physical challenge of throwing and manipulating clay, there is also the need to develop an appreciation of form, to understand the raw materials that can make up a clay body or create a glaze, to experience how these materials interact and are transformed by fire, the challenge of designing, building, loading and firing a kiln. Above all, there is the challenge of coping with, and learning from, the ups and downs, the successes and failures -and then there is the challenge of educating the public to understand and appreciate hand skills and craftsmanship, and of creating a market. I originally studied engineering, developing a particular interest in renewable energy, ‘appropriate technology’ and environmental issues -much influenced by E.F Schumacher’s book ‘Small is Beautiful’ and other writers of the 1970’s. This led me to research at Warwick University where I happened upon David Jones’s pottery studio which he then ran in some outbuildings on the edge of campus. Intrigued by the process of throwing, I enrolled for evening classes and found working with clay to be the essential balance to academic research that I was craving. in 1986, returning from spending several years working with groups of peasant farmers in newly independent Zimbabwe, I set up my first workshop whilst working at the Centre for Alternative Technology in mid-Wales. Whilst there I was able to attend courses with Phil Rogers and also with Takeshi Yasuda who both had considerable influence on my work and approach. In 1990 I moved to Dunbar and set up my current studio on Dunbar High Street. Apart from making pots, I have remained involved with various environmental and community development projects over the years, including running courses and activities which use clay as a route into environmental education and awareness. I am currently a freelance researcher and consultant as well as being a volunteer for our local ‘transition’ initiative and Development Trust, Sustaining Dunbar which I helped to set up in 2007. I am also closely involved with the Scottish Communities Climate Action Network, the Scottish Community Alliance and Community Energy Scotland. Because of these other commitments, I am currently a very part-time potter and only fire the kiln once a year. My main sales are through my annual pre-Christmas exhibition in my studio although my showroom is open by arrangement at any time. I live and work in the historic town of Dunbar, on the east coast of Scotland where the Firth of Forth becomes the North Sea, about 30 miles east of Edinburgh. My studio is in the basement of 27 High Street, Dunbar, EH42 1EN, along with a small showroom.